With its oval track that serves central Tokyo's main districts, JR Yamanote train line (it's not a subway / metro line) offers great practical qualities which certainly don't usurp its success. When traveling in the Japanese capital, it would be surprising if you didn't ride it at some point. Each train that runs on the Yamanote line spans over 200 meters long. And for good reason, since it is Tokyo's busiest line with 3.55 million passengers per day in 2005. Thus, although longitudinal seats facilitate optimal filling, sometimes stations' gloved pushers give a helping hand during the morning rush hour to get everyone inside. The loop timetable only pauses during the night for exactly three hours and ten minutes to perform a maintenance which guarantees a clean and optimal service quality. Fares go from 140¥, depending on the length of your ride, and are of course compatible with the Japan Rail Pass. Because of their rotation frequency of two to four minutes, these trains have no room for error. In a well-organized Japanese railway engineering where every train stops at every station, suicides are the feared moments that can jam an entire ballet. So, since 2008, all rail access are protected by automatic gates and the whole unlocking process takes only about ten minutes. On its website, JR East then apologizes for the inconvenience and it serves as a lateness excuse for (in appearance) impassive salary-men. 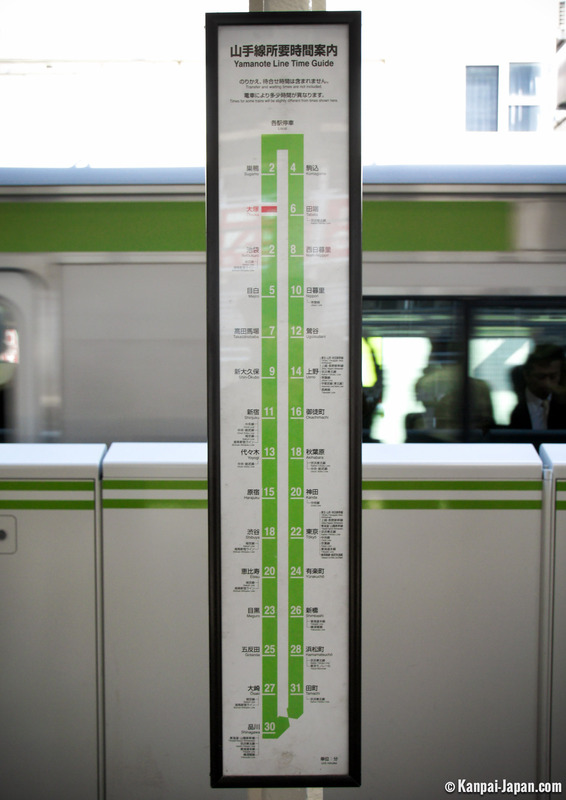 To date, the Yamanote Line has 29 stations and as many hotspots, each of them also has its little jingle sound. Clockwise, it goes like this: Nippori, Uguisudani, Ueno, Okachimachi, Akihabara, Kanda, Tokyo, Yurakucho, Shimbashi, Hamamatsucho, Tamachi, Shinagawa, Osaki, Gotanda, Meguro, Ebisu, Shibuya, Harajuku, Yoyogi, Shinjuku, Shin-Okubo, Takadanobaba, Mejiro, Ikebukuro, Otsuka, Sugamo, Komagome, Tabata and finally Nishi-Nippori (which was, in 1971, the last station added). However, JR East recently announced the addition of a thirtieth station before Tokyo 2020 Olympic Games, nearly half a century after the last addition. If its final name has yet to be decided (it could be called Sengakuji or Takanawa), the new station will be created between Shinagawa and Tamachi, south of Tokyo center, to eventually reach Haneda Airport even faster. Work should begin during spring of 2015. Note that this stretch is so far the longest of the Yamanote with 2.2 kilometers between the two stations. Each connected district has its own strong identity that reinforces the image of the Japanese capital's thousand faces, where these steel trains with green strips pass. For sightseeing, the Yamanote line often proves very convenient. No wonder other Japanese cities are inspired by it, starting with the famous Loop Line in Osaka. Note the direction of rotation: 外回り sotomawari (clockwise) or 内回り uchimawari (reverse). 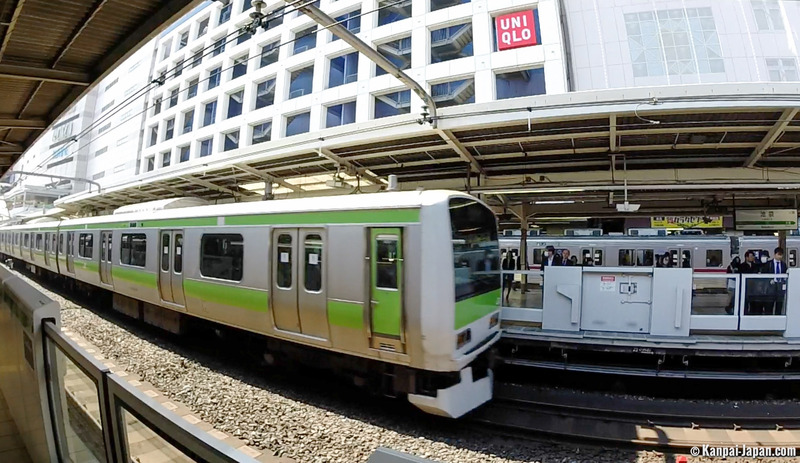 As practical as it is, the Yamanote line should not become the alpha and omega of getting around the city. JR has other train lines that cross the great Tokyo and can be as convenient depending on the ride, starting with the Chuo / Sobu lines. And we don't even mention countless private train and subway companies. In addition, some well-known neighborhoods are not served by the Yamanote such as Roppongi, Asakusa, Odaiba, Ginza or Chiyoda. Even if they are never far away, do not hesitate to get out of this intramural it creates and to which Tokyo is certainly not limited. For the nostalgic or curious, this Yamanote Tumblr offers, among other things, many of the line's characteristic music jingles.